The traditional and ethnic collection in our store excels with amazing finesse and offers you a great chance to savor the exquisiteness of the same by providing online shopping facility. 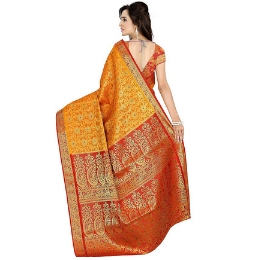 Stylish designer fancy saree from Vinhem Fashion Brand. Vinhem Fashion is prominent for Exclusive Indian Ethnic Wear in India, Established in 2012, as an online retailer offering the finest Collections in Indian wear. Vinhem Fashion offers a range of apparel, jewelry and accessories in vibrant Indian ethnic styles. Our merchandise is updated regularly so that customers have a Lumpsum choice. Company take pride in our ability to ship anywhere in the world, but at Vinhem Fashion, we dont leave anything to chance. For this reason, all of your purchases are fully insured from any in-transit damages. Shopping on Vinhem Fashion is 100% safe. We take customer privacy and security very seriously, and implement best-in-class technology to ensure your entire shopping experience is completely secure.DISCLAIMER: The colors you see on your screen may not be totally accurate to the original color of the product. It may vary depending upon your screen resolution settings and photography.